Field Rules: http://millcreeksoccerclub.org/fields-rules/ Please review field rules prior to attending soccer events. On most days, our golf cart will be available for those who need assistance to/from the fields. Concession stand is open provided there are volunteers. Bathrooms are located near football field, on path to soccer fields. Our fields are located at the Cascade High School (6565 S County Rd. 200 W, Clayton, IN). Parking is behind the school. Fields are located south of the football field. Click HERE for link to access directions on MapQuest. 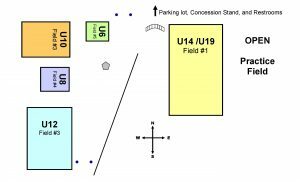 Click Fall 2016 Field Layout for current layout of the fields. (May change each season. For directions to other fields within the WCSSF go to http://www.wcssf.org/club-directory/.